Whatever the reason, you’ve decided against consuming cow’s milk. So now where do you go? The long-life milk aisle of your local supermarket may offer an array of dairy-free alternatives, but take a closer look at the ingredients and you may start to feel a little…cheated. Most shop-bought ‘nut milks’ only contain around 5% nut content. The rest is water and a whole host of other additives that are not altogether necessary. Yes, it’s easy to grab a carton from the shelf and pour it straight over your muesli. 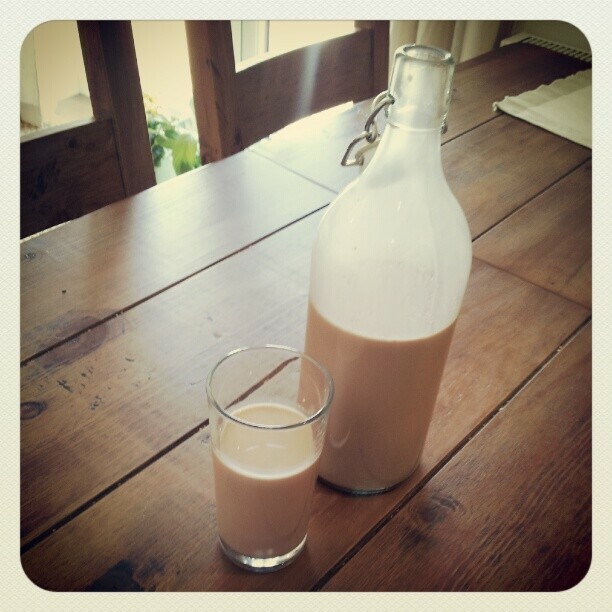 But why not have a go at making your own nut milk? It’s fresh, wholesome and deliciously easy to make. And the bonus is, you know exactly what’s in it, because you made it. 200g of your favourite nuts such as hazel nuts, almonds, brazil nuts or cashews. Feeling adventurous? Why not try a mix of several different nuts? Natural sweetener (optional), such as date syrup, agave syrup, honey or pitted dates. 2. In the morning, drain and rinse the nuts, place in a blender and add 1 litre of filtered water (less if you want a thicker milk). If you want a sweetened version, add a tablespoon of date syrup, agave syrup, honey or 3 large pitted dates. Another option is to add in a tablespoon of raw cacao or good quality cocoa powder to give it a chocolatey kick. 3. Blend for 1 minute. In the meantime, prepare your straining device. A muslin cloth, placed over a sieve, placed over a bowl works well. 4. Strain your mixture. Pour just enough mixture into the muslin cloth so that you can bring the four corners up to meet and squeeze the liquid out through the sieve (you could say it’s a bit like milking a cow…if you’ve ever milked a cow). 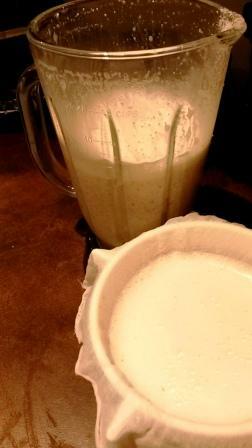 Shake out any dry mix (the ‘nutmeal’) into a separate bowl. Do this until all the mixture is strained. 5. Et voila! You now have at least a litre of smooth, fresh nut milk, that can be stored in a glass bottle for about 5 days (although I challenge you to make it last that long!). Nutmeal makes a great porridge (soaked, funnily enough, with your home-made nut milk), topped with a sprinkling of flax, pumpkin and hemp seeds for added Omega intake, and a drizzle of date or maple syrup to sweeten. You could follow the recipe for energy balls (coming soon! ), and create delicious, protein-packed snacks for on the go. Alternatively, use it to make your own nut flour (as a base for baking wheat-free bread and pastries). Spread the nutmeal out on a baking tray, and place in a low-heat oven (100°C) for 2 – 3 hours. 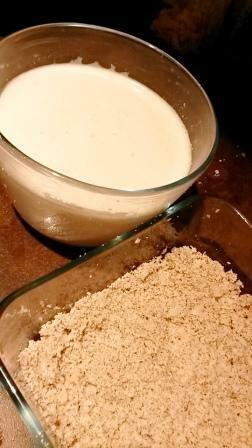 Once the mix has dried out, place in a coffee grinder until it resembles flour. Store in an airtight container for up to a month. Check in to Yogi Kitchen for more ideas on delicious ways to make the most out of your ingredients. I have the beautiful and knowledgeable Hemsley sisters to thank for this gem of a recipe (from their book, The Art of Eating Well). It is so easy and so nutritious that I just had to share it. It’s basically 50/50 egg to veg, so packed with protein, good saturated fat and a whole heap of vitamins and minerals to start your day on the right track. 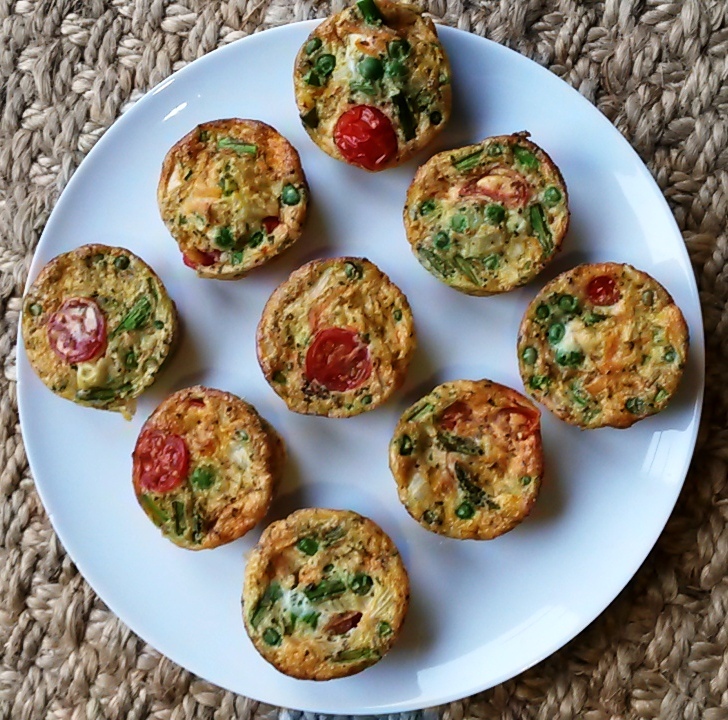 They are a colourful twist on a classic breakfast omelette, and made as muffins the night before, are easily transported in lunchboxes to school or work. I’m normally one for a sweeter start to the day, but when I feel like a savoury breakfast, these hit the spot and do a brilliant job of keeping me topped up until lunch. They are even builder-approved (devoured in an instant by the hardworking builders working on our house!). Adding grated cheddar, parmesan or crumbled feta cheese adds even more flavour and fullness to these muffins. 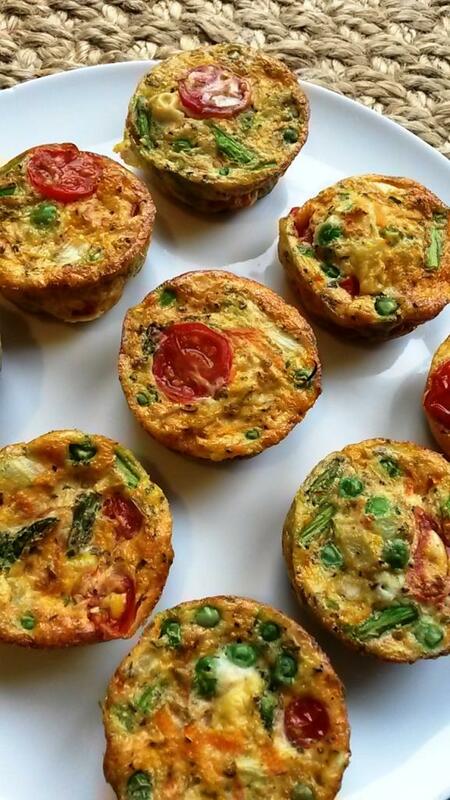 Either mix the cheese in with the vegetables, or sprinkle on top of the muffin mix before they go in the oven. • 8 eggs, cracked and whisked into a bowl. • The same amount of raw vegetables, chopped finely. I find a mix of 1 large grated carrot, 1 large grated courgette, 1 chopped red pepper, half a diced onion, a handful of peas (fresh or defrosted) and 5 or 6 cherry tomatoes, halved, is enough. But use whatever you have available that will taste good lightly cooked. • A small handful of fresh herbs, such as basil (goes well with tomatoes and feta), mint (best herb friend of peas) or oregano (lovely with cheddar or parmesan). • Sea salt and black pepper to taste (the more cheese you use, the less salt you need). • Preheat the oven to 180°C and grease a 12-portion muffin tray with butter. • Mix all the ingredients together in a large bowl. • Spoon the mix equally into the greased muffin tray. If you prefer, keep the cheese out of the mix until this point, and sprinkle on top of the muffins before putting in the oven. • Pop in the oven for 15 minutes until the muffins are lightly browned on top and just set in the middle. Remember, egg keeps on cooking while it is hot so be careful not to dry them out. • Take the muffins out of the tray to cool on a rack. 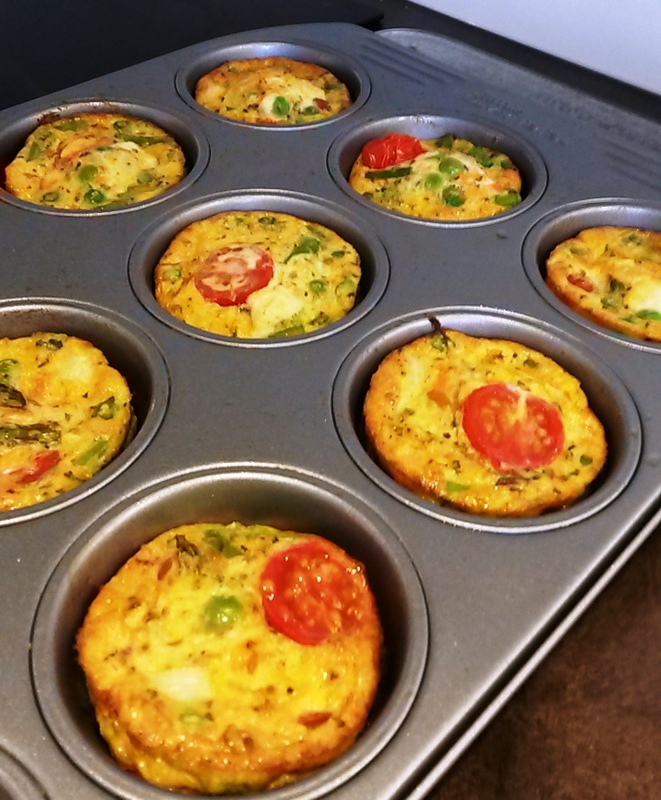 Enjoy them while they are still warm or wrap them up in parchment paper to take with you to work, school, the gym, hiking, cycling…whatever you do in the morning that requires a good EggyVeggie muffin to keep you going! 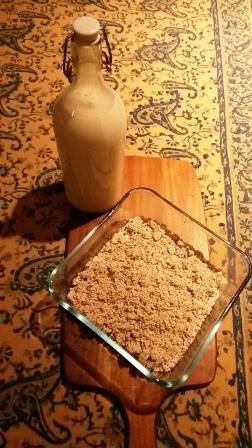 This had to be my first recipe post. It’s just an unrivalled winner when it comes to a super boost of nutrients, along with hydration, flavour and colour. 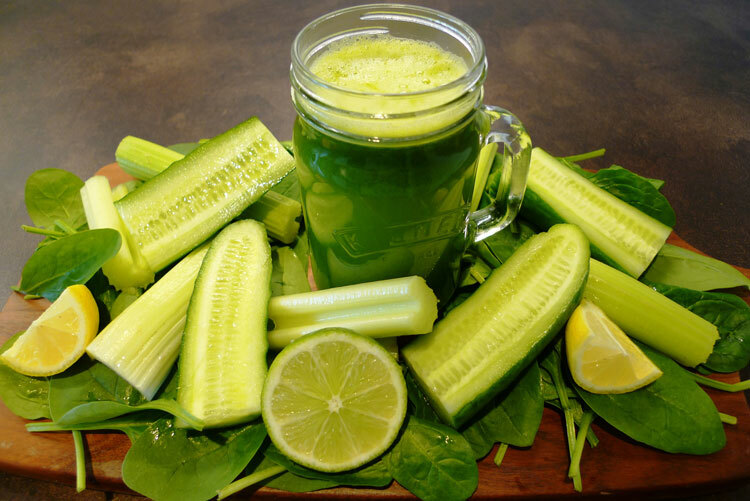 If green is not your thing, shut your eyes for a moment and imagine a shot of pure vitamins and minerals entering your body, activating your digestion, cleansing your blood, repairing your cells, improving your skin, boosting your energy, building your immune defence and making you shine from inside out. Now open them and get over your green phobia. This juice tastes great, and can be adapted to include a range of colourful vegetables once you are feeling adventurous. I use a cold-press, masticating juicer as my preferred method of extracting the juice (let’s save the what’s and why’s for another post), but any juicer that separates the juice from the pulp is fine. I’ve also given options for blending if you don’t own a juicer – just bear in mind how powerful your blender is, and whether it’s up to the job of extracting the juice out of tougher vegetables. Baby spinach is easier to blend. Use not-from-concentrate apple juice from a carton (look out for cold-pressed versions appearing in shops now; they are unpasteurised and therefore the sugar content is not as high as pasteurised or concentrated versions), or try using coconut water instead. Leave out the celery, unless you have a powerful blender. Grate ginger finely, or use 1 teaspoon of ginger powder. Add in half an avocado (or a small banana if you prefer it sweet) for a thicker, silken texture. 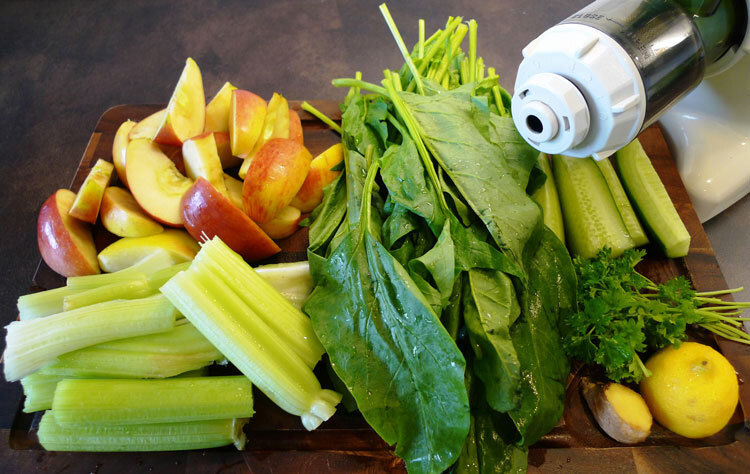 Chop all the ingredients to the appropriate size for your juicer (some juicers require more preparation than others), and feed through. Transfer the juice to a flask or jar (with a lid), squeeze in the lemon, add any Supercharge! ingredients, and shake well. Add the liquid first, then the spinach, cucumber, grated ginger, avocado and/or banana. Squeeze in the lemon, add your Supercharge! Ingredients, and blend until smooth. Serve your juice straight away, or decant into jam jars to take with you. Get your green on and go,go, go!